I'm not sure about you, but I love a good puzzle. Have done for years. When I was a kid, I used to love jigsaw puzzles. Nowadays, I don't like to do anything on a Sunday before finishing the Daily Mirror's Sumdoku puzzle. It's like Sudoku but way harder! I'm also a huge game fan,.. Fill in squares using simple hints to reveal the hidden picture. 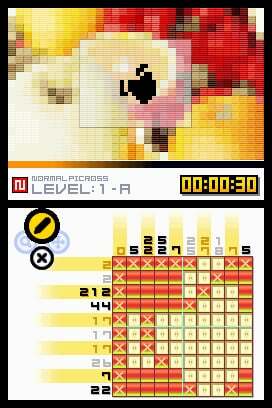 Players need both puzzle-solving skills and creativity to earn a picture reward. 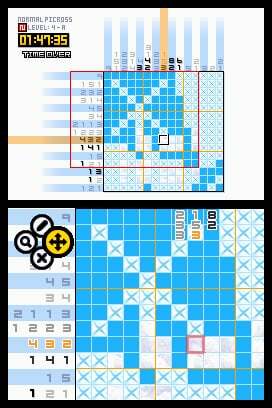 Creating puzzles is a snap. 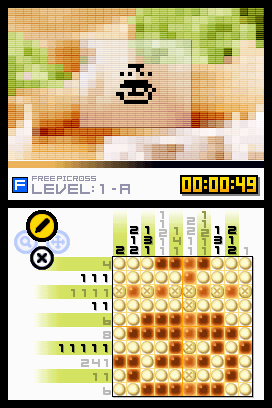 Players design their puzzles by hand or draw any picture they like and convert it automatically into a Picross puzzle. Trade puzzles with friends using local wireless or Nintendo® Wi-Fi Connection or download free bonus puzzle packs. 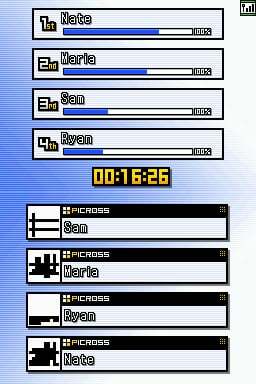 Play with up to five friends in Picross-themed minigames over local wireless, or race to complete puzzles against other gamers on Nintendo Wi-Fi Connection. 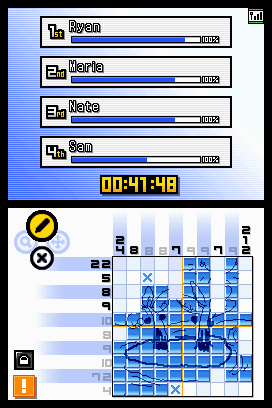 How to progress through the game: Each puzzle has a sequence of numbers written in the margins of each column and each row. 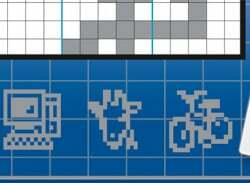 Those numbers show how many squares within that column or row need to be filled in. 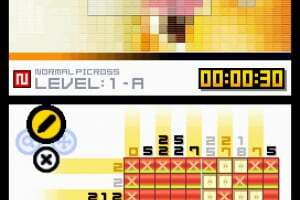 Players must deduce where each filled square is based on the numbers in the puzzle. 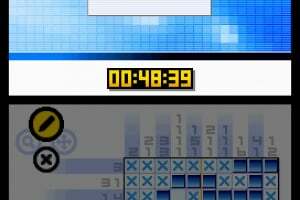 Incorrect guesses earn the player a time penalty. 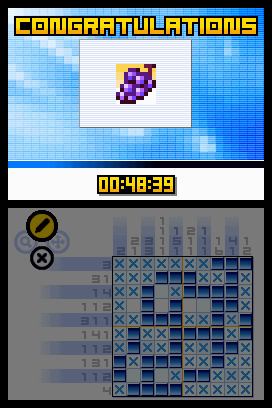 If players solve the puzzle in under one hour, they earn a reward picture, an animated illustration of the thing represented in the puzzle. Puzzles range in size from simple 5x5 squares to much more challenging 15x15 squares—and larger. 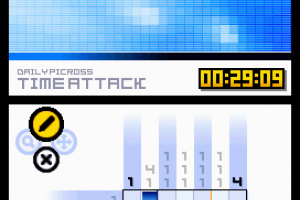 Players can create and swap puzzles with one another. 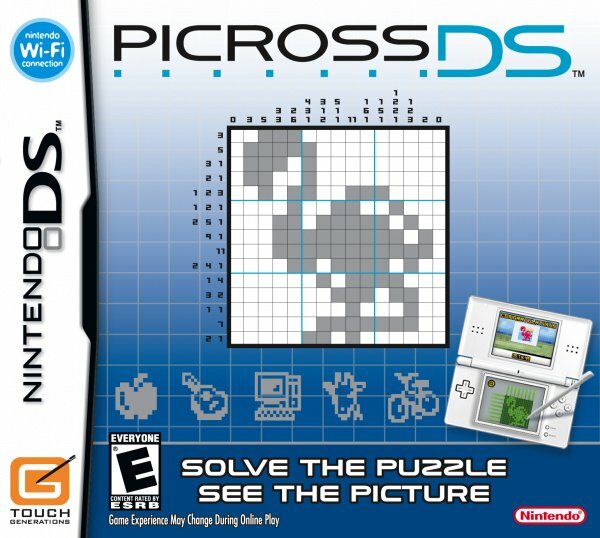 My Picross: With My Picross, players can create their own puzzles, complete with reward pictures, and transfer them to friends using either local wireless or Nintendo Wi-Fi Connection. 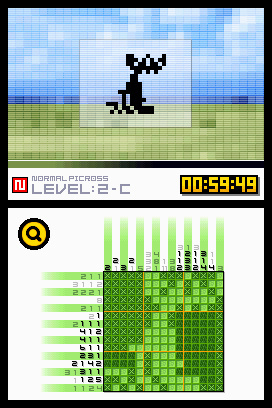 Because making a good Picross puzzle can be challenging, Picross DS automates the process and helps correct errors in homemade puzzles. 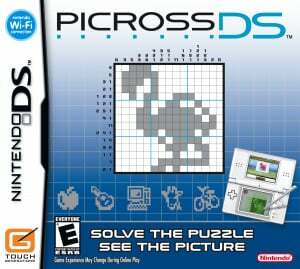 Additionally, Picross DS can automatically generate puzzles from any drawing made in this mode. 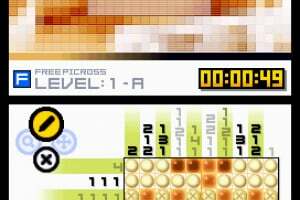 Daily Picross: Daily Picross features a series of quick-play puzzle sets that players can return to day after day to test their skill over time. The longer players have the game, the more activities open up. 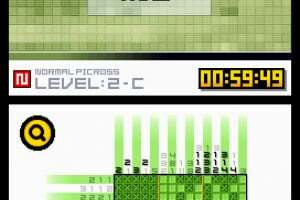 Each activity features a special challenge that builds Picross skills. 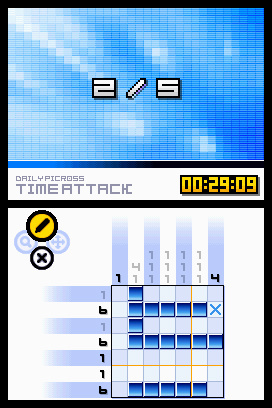 Daily Picross modes include Nonstop Time Attack (players solve a series of simple puzzles as quickly as possible), No X Marks (players cannot make notes on the game screen), Error Search (in which players must find the incorrect squares in a puzzle) and more. These challenges open up over time. 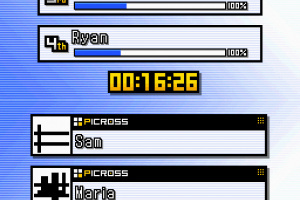 Local Wireless: Host a game with up to four friends (a total of five people), and test their Picross skills with Multi-Picross word and picture challenges. 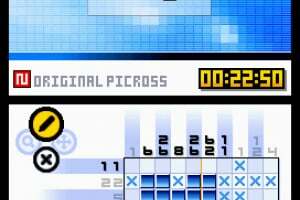 In word challenges, the host writes out a word that gets divided into a series of Picross puzzles (one for each letter), and players must solve the individual letters until they can guess what the word is. 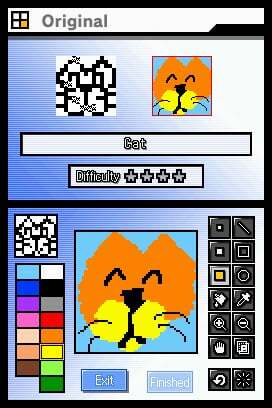 In picture challenges, the host draws a picture that gets converted instantly into a Picross puzzle. 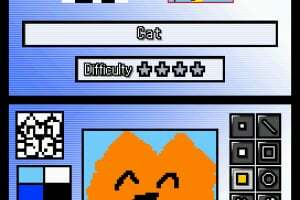 As players solve the puzzle, they’ll also uncover the host’s original drawing—the player who correctly identifies that drawing wins. 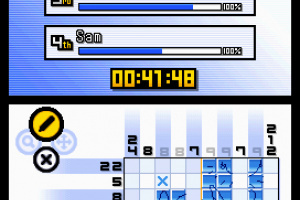 Multiplayer matches can be played using only one game card, so anyone with a DS can join in. 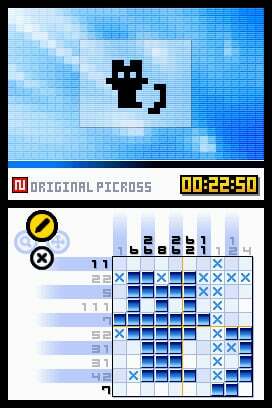 And, of course, players can exchange puzzles they’ve created with one another, opening up a new world of challenges and, if their friends are curious about Picross, they can send a downloadable demo puzzle. I already LOST IT. Don`t buy it!!!!!! !